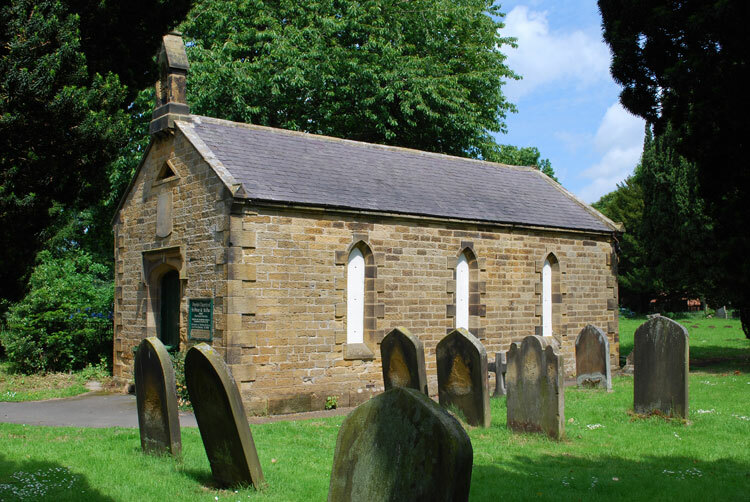 Stokesley Church Burial Ground has six burials from the First World War and Second World War in the churchyard, three of which are those of men of the Yorkshire Regiment. 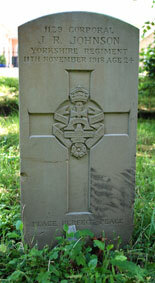 Ray Wilkins (<e2ray3636@ntlworld.com>) has provided photos of the 3 graves of men of the Yorkshire Regiment. 4th Battalion Yorkshire Regiment. 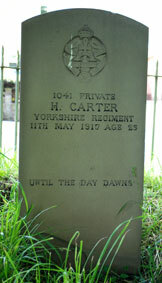 Son of John and Jane Carter, of West Green, Stokesley. 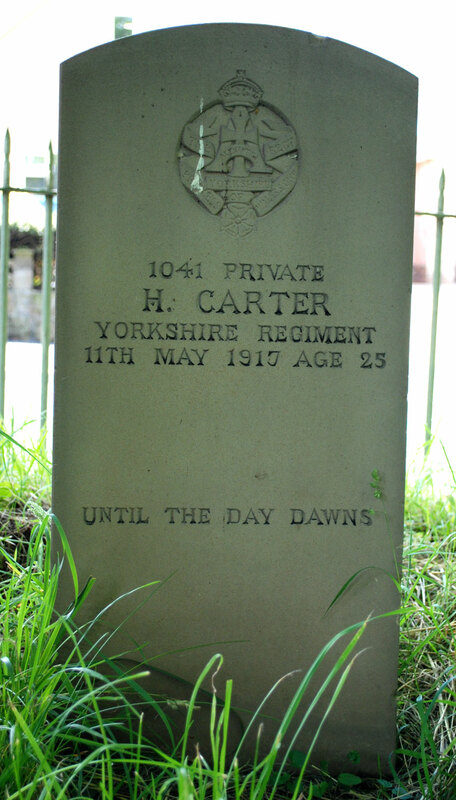 Died at home 11 May 1917. Aged 25. This is a somewhat unusual CWGC headstone, in that there is no cross on it (or anything to denote a particular religious denomination). 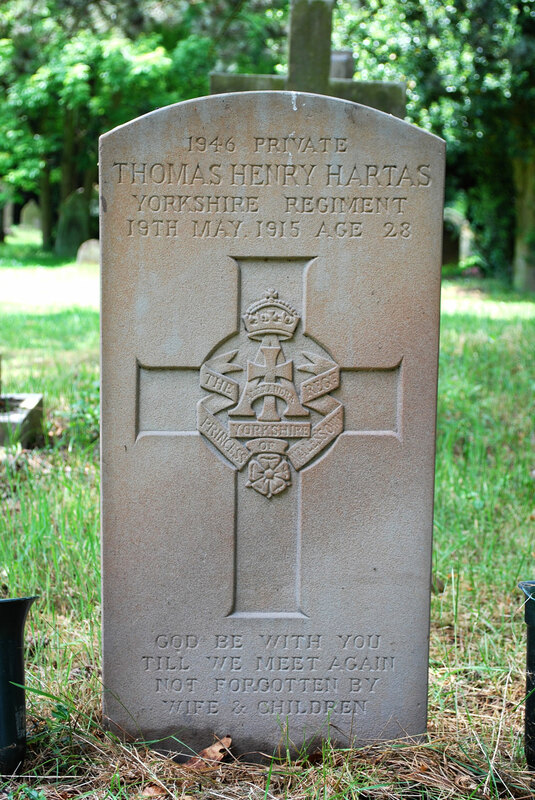 Private Thomas Henry Hartas, 1946. 4th Battalion Yorkshire Regiment. Son of Thomas and Mary Hartas, of Ampleforth, York; husband of A. E. Hartas, of West Terrace, Stokesley. Died at home 19 May 1915. Aged 28. Born Ampleforth (Yorks), Enlisted Stokesley. NOT FORGOTTEN - BY WIFE AND CHILDREN"
Corporal J R Johnson, 1129. 4th Battalion Yorkshire Regiment. Son of Christopher and Margaret Johnson, of Great Ayton, Yorks; husband of Amy Johnson, of White Cottage, Brookside, Stokesley. Died at home 11 November 1918. Aged 24.